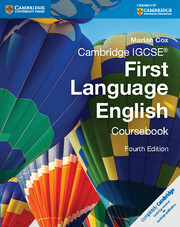 This updated, write-in Cambridge IGCSE First Language English Workbook (fourth edition) can be used for independent learning, for homework tasks or revision. It contains text extracts from around the world with linked exercises for students to practise the skills they need for the Cambridge IGCSE. Exercises are grouped into 12 diverse units on cross-curricula topics which are not linked to the Coursebook themes, so students remain engaged in the reading material. 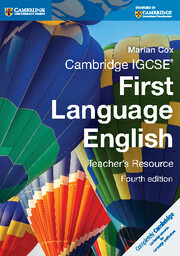 The Cambridge IGCSE First Language English Workbook (fourth edition) has been completely updated in line with the new syllabus. 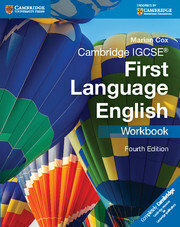 It is particularly suitable for students who need additional support with language and grammar. A microsite provides free online resources to support the course. This write-in workbook includes exam-type questions for skills practice as well as language exercises on spelling, punctuation, vocabulary or grammar. The Workbook has been completely updated in line with the new syllabus, bringing reading texts and content up-to-date and relevant. It is totally independent of the Coursebook (although of course the skills it covers are the same) so can be used as a standalone resource or with other components. The structure is user-friendly with numbered tasks with space for students to complete the tasks in the book, grouped according to skill such as directed writing, reading comprehension and summary.